The march to approach the great appointment of the next 21 July in Scanno (Aquila) has begun. A few weeks ago the registration for the events was started XTERRA Italy, Lake Garda and Lake Scanno, today we present the first important partnership that the organizational committee of Scanno, X-Tribe, has concluded with one of the most prestigious brands in the world triathlon scene, Orca. Spanish brand, which produces and sells technical apparel mainly for use in triathlon, wetsuits, swimming accessories. The search for XTERRA Italy Lake Scanno had the objective to be able to provide something useful that could affect both the layout and the value of the product. The sounder has been passed to all the accessories that a triathlete needs and the attention has stopped on two products in particular. A transition bag, essential to better organize the various phases before and after the race without having to literally throw everything inside a bag, but using the numerous sealed pockets of the backpack and the various compartments to keep the wet material separate, the one used in the race by what is instead clean and must not be in contact with other materials that could compromise its durability. In addition it is easily transportable as a normal backpack removing the embarrassment that is often seen in the races of shoulder bags that prevent movements in approaching the exchange area and its output. 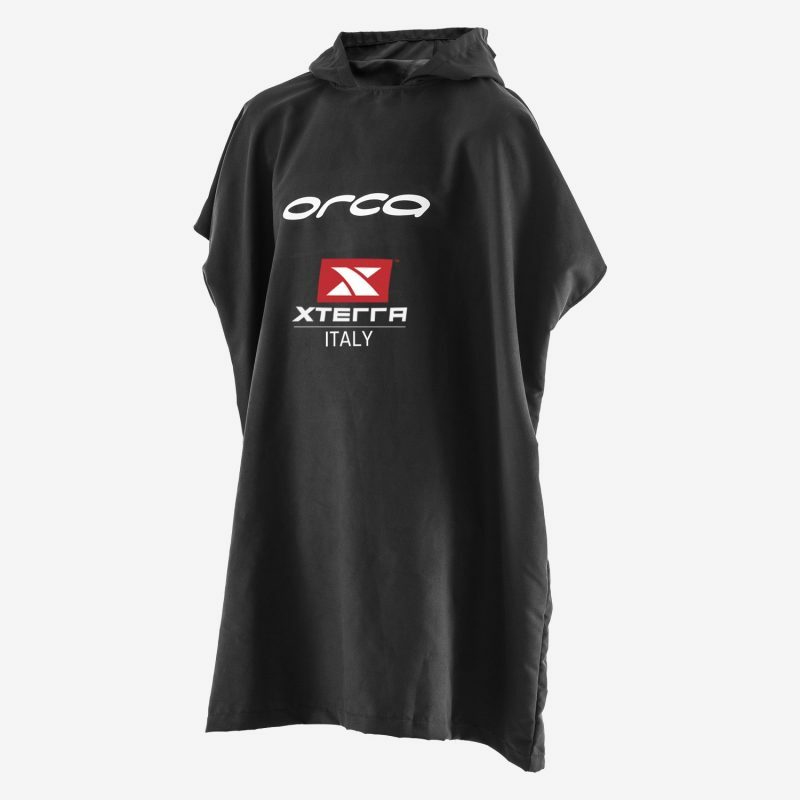 The graphic design of Orca along with the prestigious XTERRA brand certainly make the object attractive and prestigious. Who does not want to always carry with him something of the best events in which he participates? The second one is a piece of clothing that is starting to be increasingly used by triathletes. On its non-use we could tell stories of improvised stripping and clothing to the limits of obscene acts in public "contests". Someone uses a simple towel, someone else's bathrobe, with results of little success. The poncho, fill this gap by letting the body enter and exit the pack or body very quickly and without any difficulty. Already used a lot in surfing for the same reasons it makes the operations simple and fast, allowing, if the weather conditions are not friendly, a direct shelter from the cold that in the post race we know to be very frequent for a number of factors. The poncho is also "branded" with the two brands clearly visible on the front. An almost unavoidable duo, which gives XTERRA's Warrior, glory of the event and style. First of all, both the bag and the poncho are reserved exclusively for those attending the event. So: you sign up, choose one of the two items, or both and pay the 50% of the total cost as a down payment. On the race weekend you can collect the reserved items and settle the bill. Keep it simple. Last but not least. The transition bag was voted best in the 2017 class. You want to know the costs no? The limited edition backpack is sold at the special price of 99 € compared to the 139 € of the Orca price list. The poncho instead 32 €, instead of the 39 € of the price list. This item has been inserted into Lake Scanno, Top S and tagged killer whale, Partners, transition bag, XTERRA, XTERRA Italy. 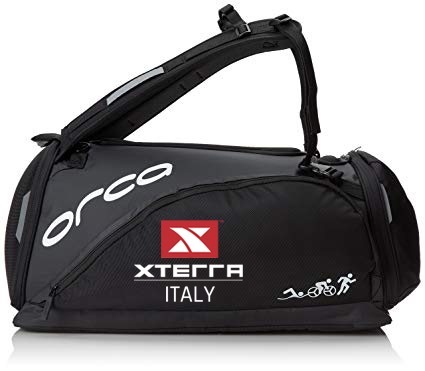 10 thoughts on "XTERRA Italy Lake Scanno: Orca partnership at take-off"
Hello Corrado, the 50% of the price of the article means a deposit for the reservation of the item. Good morning, where can I order accessories since I have already registered? Hello Graziano shortly we will publish the procedure to book the articles. And who has already registered? There is no possibility to buy them if you can not participate in the race? Hi, the articles can also be purchased by those who intend to enroll in the sprint distance of the Xterra Scanno? Of course, the promotion is valid for both distances.